I have to admit, I'm a geek about maps. I learned how to read them when I was young. I collect them. I have lots of old maps from the early 20th century and several atlases. And let's face it, old maps are very useful when you're trying to find places whose names have changed. But I think this one is especially cool. It's a 1929 world atlas published in Moscow. So it has the Soviet/Russian names of places from that era, in Russian, which will help make them easier to recognize in documents. And they're typeset, which makes it easier for me to read them! (I can read handwritten Russian, but printed is so much better.) But it also has that lovely "Soviet" perspective on the world that you can find only in period documents. When it arrived in the mail, I opened it up to a random page and found ... California! 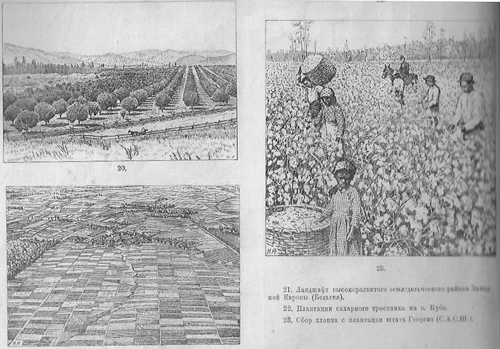 The scan above shows (starting in the upper left and going clockwise) orange groves in California, picking cotton in Georgia, and an agricultural area in Belgium. Oh yeah, and when it was new, it cost 4 rubles and 50 kopecks. The price is printed on the back cover. Those three images on the same page? Is there any connection that is offered or are they just there because there was no place else to put them? Those three images were scanned exactly as they appear in the atlas. There are several pages in the front of the atlas with images from various places around the world. I didn't see any connections or theme, just showing different parts of the world.